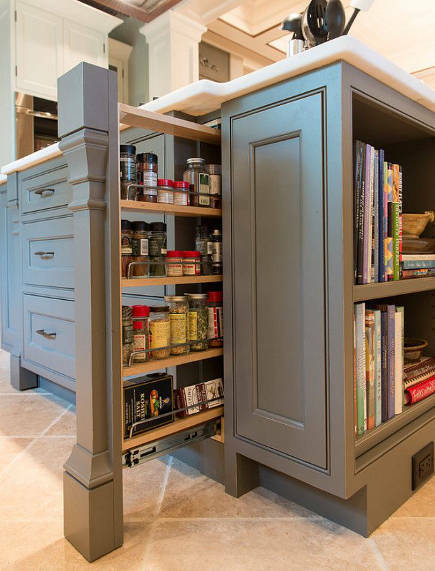 A dozen different kitchen cabinet pull out ideas to upgrade and customize your cuisine. When you’re redoing a kitchen there can never be too many options. That’s why we continue to hunt for clever kitchen cabinets pull out ideas and other specialized storage and utility features. Finding three in the same kitchen is a bit of a bonanza, starting with a pair of deep drawers below a main kitchen sink [top]. It’s rare to find a kitchen since with drawers — usually the choice is a conventional sink-base cabinet with doors. 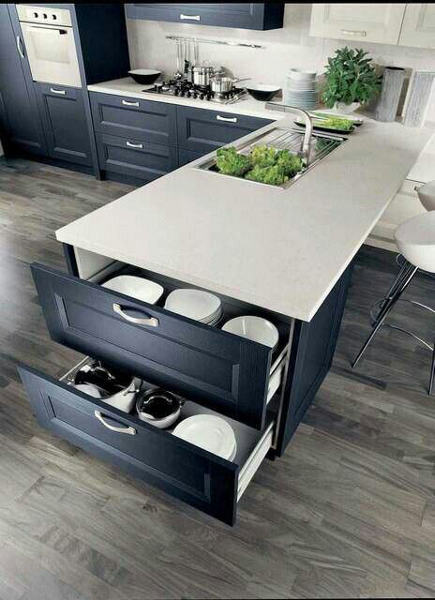 This has been a popular photo to bookmark because it’s innovative and drawers have benefits: handy storage within easy reach and access to the rear of the lower tier. 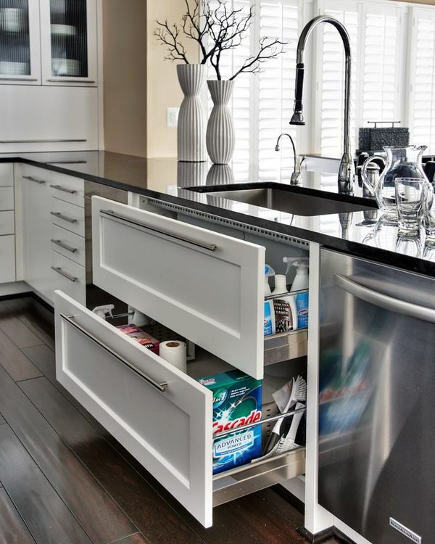 Sink drawers are only possible with frameless cabinets, however. Then you’re leaning in against a metal bar handle (which could be avoided with a pair of pulls). If one of the drawers and the adjacent dishwasher are open simultaneously, access to the sink can be difficult. But this arrangement eliminates the usual under-the-sink mess. 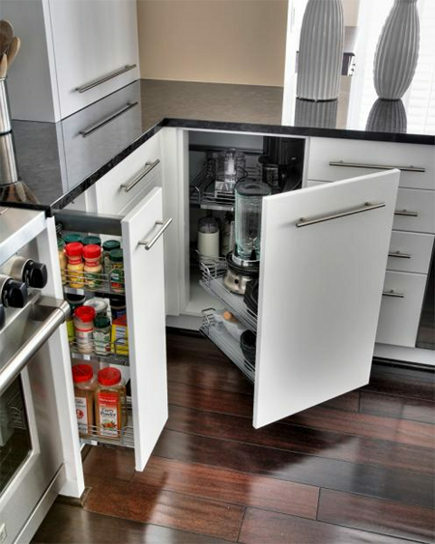 The same black and white Maryland kitchen avoids the issue of a twirling susan in the corner with this lower cabinet panel that opens out at an angle another unusual cabinet pull out idea. 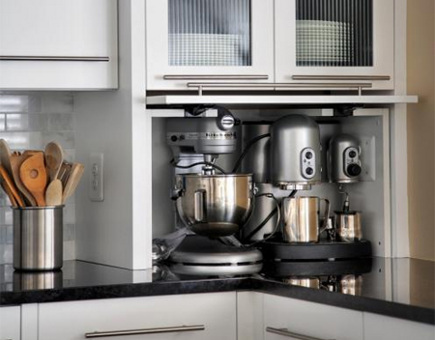 We’ve seen appliance garages forever but this one fills somewhat dead space on the corner of an island and becomes the modern equivalent of a space-maximizing chest-on-chest arrangement. I can imagine pots and pans clanging when they are pulled forward on this Glideware bar. Still, this is really efficient storage pull out and hooks are super sturdy. 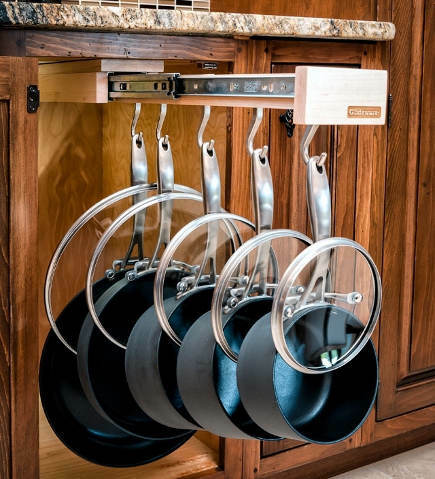 Rev-A-Shelf offers a variety of after-market kitchen cabinet pull out ideas and the brand is carried at big-box and specialty stores. 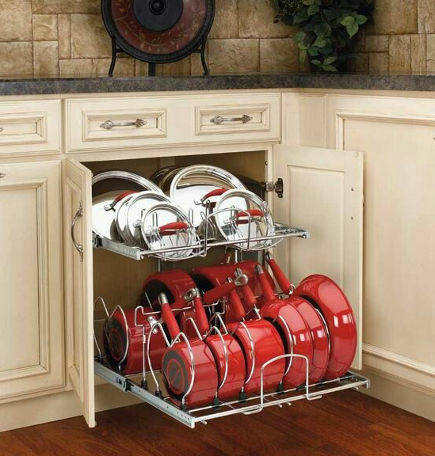 This 21-inch double tier pot pull-out is the larger of two widths and has adjustable separators. 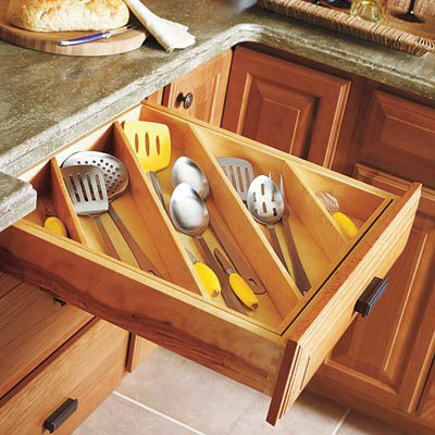 A diagonal divider solves the issue of utensils that are too long for a narrow drawer as it maximizes space. This one fits Diamond cabinets but can be easily copied. 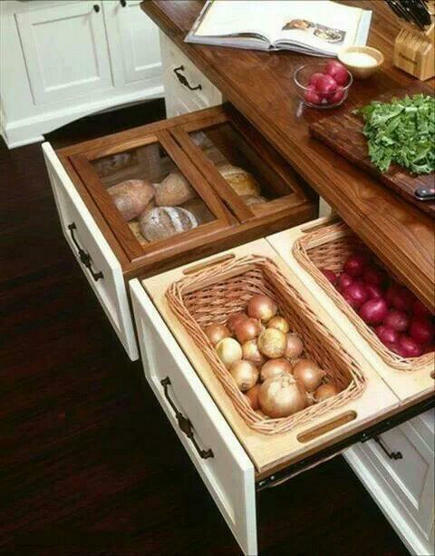 I’m not sure whether I love this vertical storage drawer or maybe not so much. The stainless inserts are genius because they are bulletproof and can easily be slipped out for cleaning. 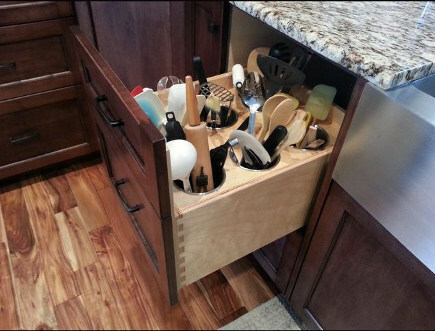 And it’s a great idea for a baking center or prep space away from the main clean up area. (This is a polite way to say I like the pull out but not the placement – my trash bin is to the left of my sink and I cannot imagine having a potato masher and spatulas there instead). Allison showed a similar vertical storage feature for silverware in her Custom Kitchen Cabinet Ideas post. 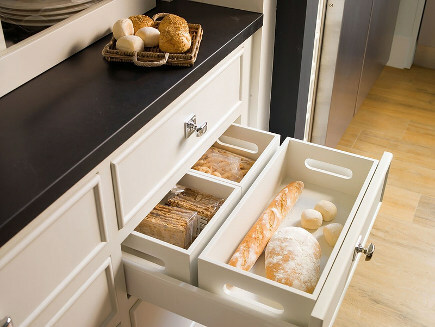 Bread drawers that can be removed and brought to the table are a another delicious idea from Delounder kitchen designers whose Barcelona Modern kitchen is one of my all time favorites. A double covered bread bin pull out is more utilitarian than Delounder’s but no less functional. Baskets are not only ideal for root vegetable pull-out storage because they permit air to circulate but they can be easily removed and brought to the prep area they stowed neatly away. 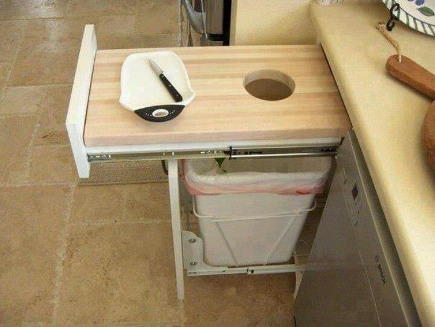 Here’s another variation on the cutting-board over trash bin I showed in Nine More Special Kitchen Features. While it’s still a bit narrow, with the cut-out in the back, there’s more working room for the cook in front. Drawers on the end of an island open into an aisle – true. But that is usually out of the main work space and with enough clearance it’s a great storage location for dishware, often midway between table and dishwasher. Pilasters are usually decorative elements but how clever to place a spice pull out behind one! It’s always so much fun to show off such a unique hidden kitchen feature. I don’t get the first picture; how can you store anything in that top drawer when the sink is on the inside? The drawer is deep and configured to fit around the sink. Storage would be only on each side but those products are easy to reach. Hi, Can you please tell me who makes the sink base cabinet in the first picture?? I have been searching to no avail and I am currently installing an all drawer kitchen. Your help is greatly appreciated.